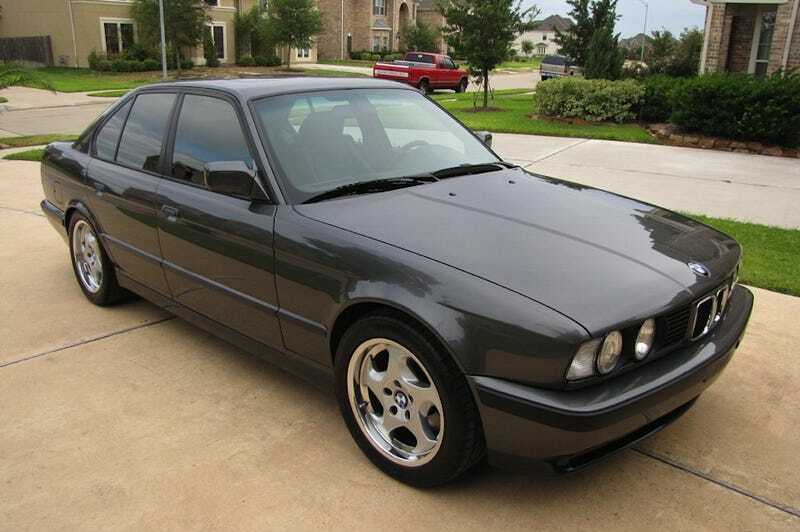 If you’re into numerology then you might find it interesting that the E34 was the last M5 to carry a 6 cylinder engine. Today’s Nice Price or Crack Pipe 1991 has had its S38 replaced, and we’re going to see if its most important number - its price - makes this Five the one for you. The E34 M5 was the last iteration of that model to have been hand built at BMW’s Motorsport GmbH subsidiary. Not only was today’s 1991 M5 one of those, but it is additionally unique in being an Individual model. That denotes BMW’s concierge customization program that - like Burger King - lets you have it your way. In this case, the original owner’s way included what is claimed to be the only Sebring Grey metallic top coat worn by a US E34 M5, plus Black Nappa and M cloth interior. Of course it also included the balls-deep amazing S38 B36 DOHC straight six, M-Technik’s 310-horse, 3535-cc rockanrolla. That engine didn’t make it to this car’s present 157,000 mile marker but that’s okay. Unless you are totally OCD about matching numbers on your cars, then you’ll most likely appreciate the fact that the current motivational speaking duties on this M5 are currently being handled by what’s described as a brand new S38, one with only 1,500 on its watch, and installed by Motorworkswest in New Jersey. The car is apparently bunking at the shop right now as the present owner claims to be deployed in Afghanistan and as such not readily available to offer test drives without going AWOL. Should you want to pay the car a visit you could confirm the ad’s claims of the quality of the exterior - said to be a good 8 out of 10 - and interior, which in the pictures looks amazing. Mechanically, along with the new mill, the seller says that the suspension was refreshed 6 years ago ensuring the car doesn’t suffer the shimmy shimmy cocoa pop that plagues some of the cars at this age. Other updates and potential plusses are Euro smileys, polished rim M-System II Throwing Stars, a Dinan chip, and new tires all around. On the down side, the ad notes that the driver’s side door panel needs replacing but that two extras will come with the car. There’s also some rock chips in the paint, as would be expected of a 22 year old car sporting over 150K on its OEM spray job. Of course, it can’t be all that bad as the seller also says the car is featured in the 2013 Bimmerforums E34 calendar, and he’s throwing in a pair along with the car. That bonus is small potatoes compared to the fifty grand that is said to have been lavished on the car in the past 5 years - those S38s don’t come cheap - but the question for today isn’t about the past. Instead, we’re interested in the future, specifically the future of this car and it’s potential new owner. According to the ad, the near future melding of car and new owner is only one number away. At present, that number is $21,000. What do you think, does that price make this M5 Individual number one in value? Or, does it mean this BMW’s number is up? Bimmerforums, or go here if the ad disappears.